With record prize money, Kelso racecourse is set for a cracking season in 2017-18. Prize money at Kelso Racecourse will top the £1 million mark for the first time during the 2017-18 National Hunt season. 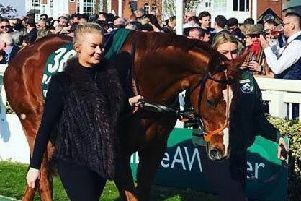 The season will consist of 15 race days – one more than last season – including the popular Border Principles Raceday on Sunday, October 8 and the Halloween Meeting on Saturday, October 28, when the track is preparing for an appearance from last year’s Lucinda Russell-trained Grand National winner, One For Arthur. The opening day at Kelso takes place this Wednesday, September 20 – the only evening fixture of the season – with an official first race time of 4.30pm. The gates will open at 2.30pm, allowing racegoers to enjoy an additional race before the official programme begins. Riders competing in Woody’s Inspirational Ladies Race, at 3.45pm, are attempting to raise £100,000 for the Radio Borders Cash for Kids Campaign. The race is the brainchild of ex-GMTV presenter Woody Morris, who has enlisted the help of 11 other local riders, including Grand National-winning jockey Ryan Mania, to raise money to tackle child poverty in the Borders. The final race on the programme, the Radio Borders Cash4Kids National Hunt Flat Race, is also named for the charity, which will be raising funds with its supporters in the Paddock Marquee throughout the evening. Malcolm Jefferson held his annual owners’ day recently and he intends to run newcomer Northern Soul described as “an attractive, athletic horse with plenty of size and scope”. The feature race, due off at 6.30pm, is the Class 2 Bannerman Burke Law Handicap Hurdle Race, with a prize value of £15,000. The race is sponsored by the Border lawyers Bannerman Burke, whose guests will make the presentation to winning connections following the two-mile event. This was won 12 months ago by Martin Todhunter and Wisty, who has since been a revelation by winning three from three over fences. Maurice Barnes, who saddled a 50/1 winner at Perth recently, is keen to run Desert Island Dusk, a Hexham scorer over the summer, while Nicky Richards is entering Caius Marcius, second in a valuable hurdle at Perth last month. Public bars across the racecourse will be serving a fresh brand of lager this autumn and the main steeplechase of the day has been sponsored accordingly. The Belhaven Saltire Lager Handicap Chase is a Class 3 event over two miles. Ray Green saw his French-bred mare Martiloo open her chase account last month and the eight-year-old was second over course and distance at Kelso’s final meeting of the spring in May. Maurice Barnes’ Indian Voyage is being targeted at this and the Cumbrian raider was an impressive winner at the Borders track in November 2015. The opening race on the £47,000 programme is the Edinburgh Gin Novices Hurdle Race, while the six-race card is completed by the Tweed Salmon Fishers Handicap Steeplechase and the EPDS Racing Welfare Handicap Hurdle. An Fear Ciuin is trained in Ayrshire by Mike Smith and could attempt to go one better, having been placed second in four of his five starts this season. The meeting will be the first since managing director Jonathan Garratt took charge at Kelso Racecourse, having joined the management team at the beginning of September. He said: “The quality of the programme at Kelso is testament to the work of my predecessor, Richard Landale, who has developed races which attract some of the best horses in the country, while also providing opportunities for the development of the horse population in the north.